Skip to the Recipe… I had become accustomed to using a high-quality commercial mushroom stock which was always available at my local market. Then, it wasn’t. 😡 Given that I was just fixin’ to make my Mushroom Risotto, this was a mini-crisis… at least in my mind! Our middle sons – Evan and Gaelen – (whom I enjoyed cooking with weekly until last year) love to refer back to “dramagranates” – a Christmas day incident when all 3 of my pomegranates for Christmas dinner were completely black inside. OMG! 😯 Did I carry on… “The natural foods market conspired to ruin Christmas dinner!” We all laugh about it now, but I was dead serious at the time. Food is taken very seriously at Andersen casa. So, back to the mushrooms. That evening, I started working on developing a lush, full-bodied mushroom stock. I started saving stems from both fresh and dried mushrooms – all varieties. I saved the liquid from rehydrated dried mushrooms that didn’t go into the pot, etc. Many recipes suggest buying fresh and/or expensive dried mushrooms to make stock. NO WAY. I’ve made my own chicken, beef, turkey, and vegetable stock for years. I even have beef tongue stock in my freezer. Making stock is resourceful, tastes better, and it’s CHEAP. Don’t we all appreciate CHEAP? If you had to grow your own food, would you still feel comfortable throwing it away? When I save scraps for stock, I try to keep them clearly labeled in freezer bags. Have you ever pulled a bag out of the freezer with no clue as to its contents? I save the ends of onions, the green part of leeks, and past-their-prime carrots and celery for all types of stock. I do save other vegetables (excluding bitter or strong flavored ones) for my vegetable stock. Keep in mind that your stock pot is not a garbage can; keep stuff that is past its prime but still edible. If you want a full-bodied and complex stock, it needs to contain more than just mushrooms IMHO. So, I pull out my bag of mushroom bits, and my bag of appropriate veggie scraps as well. Roasting the components of stock draws out the most flavor. The additional step is worth the trouble. I always include a bulb of garlic. Just because… We. Love. Garlic. I also add a bit of sherry or marsala to the pot. Both the alcohol and the garlic are optional. I do add bay leaves to the pot, but prefer to add other herbs later as the stock goes into a dish. Does it sound amazing? I hope you will consider giving it a try. It may take some time to save the mushrooms and other veggies, but what do you have to lose? Need ideas for how to use your delicious Roasted Mushroom Stock? You can use it in place of any broth/stock in dishes that feature mushrooms. It’s fabulous in my Seared Scallop With Mushroom Risotto. Skip the scallop, and it’s a filling vegetarian option. Try it in Pressure Cooker Lamb Stew Provençal instead of the beef. You can boost the umami flavor in a stir fry like my Beef and Baby Bok Choy Stir Fry With Black Rice and in my Shiitake-Ginger Bathed Fish in Parchment Paper. I’m looking forward to using it in a healthy cream of mushroom and wild rice soup… soon! 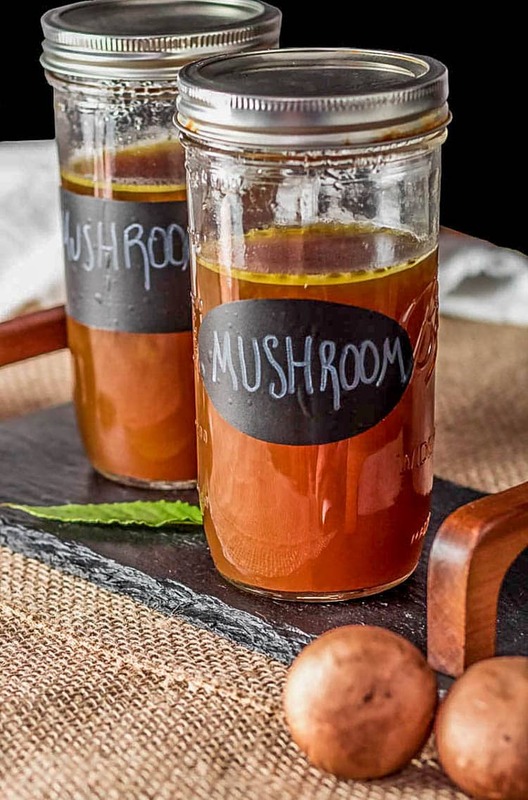 Rich, flavorful, earthy mushroom stock tastes fabulous in your homemade soups, stews, and risottos, and it's a great way to use stem ends, past-prime mushrooms and vegetable scraps! Preheat oven to 425 degrees (400 convection roast). 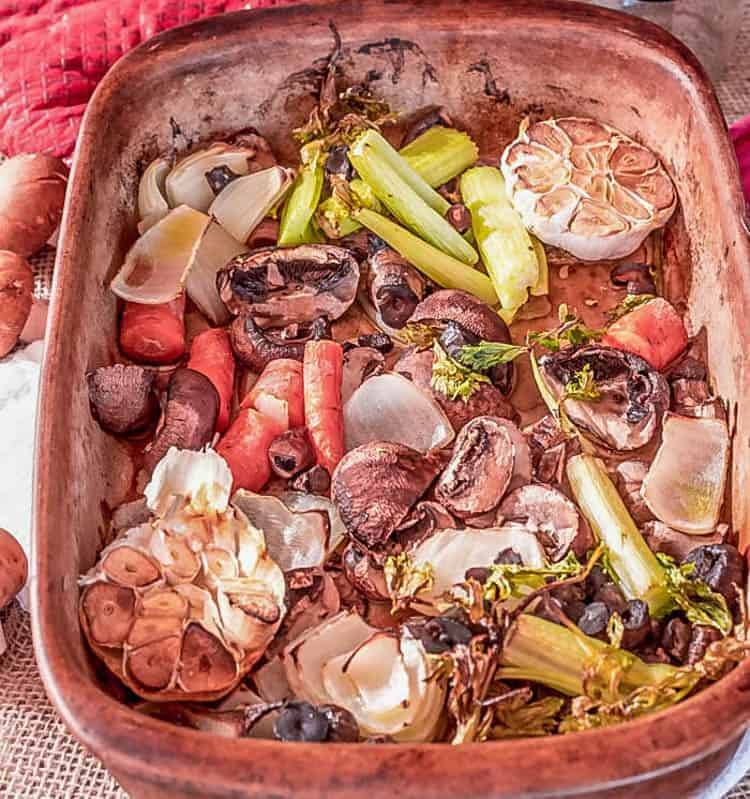 Spread mushrooms and vegetable scraps in a baking pan. Add the halved garlic bulb. Drizzle all with oil. Place in hot oven. Stir to rearrange every 10-15 minutes. Roast until edges begin to caramelize - about 20-30 minutes. Add to pot. Cover with liquid and sherry or marsala if using. Add bay leaves. Lock lid in place. Cook on high pressure 30 minutes. Do a natural pressure release. Bring to a boil. Reduce heat to a simmer. Cover. Simmer 1 hour. Pour the cooled stock through a fine mesh sieve, pressing solids to extract as much stock as possible. Store in clearly marked zip bags or other freezer container. Stock will keep 4 to 6 months in a refrigerator freezer compartment. "Mushroom bits" can include stems from both fresh and dried mushrooms, as well as mushrooms that are past their prime. "Vegetable scraps" may include the green portion of leeks, carrots, celery, onion scraps, shallots, etc. Avoid any strong flavored vegetables. You can reduce the recipe easily. Just use at least 50% mushrooms to vegetables, and cover with an equal amount of liquid. For example: 2 cups mushroom bits, 2 cups vegetables, and 4 cups liquid. Using an IP/pressure cooker cuts the cooking time in half (over cook top). Roasting the vegetables prior to cooking the stock does add 20-30 minutes to the process, but it's a critical step in achieving the deep and complex flavor of the stock! 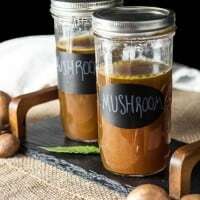 I have never come across mushroom stock cubes, but have used bottled mushroom ketchup for years. I cannot wait to try this instead. Thank you for the beautiful initial recipe and to the contributors for your variations. Yay! Thank you so much for taking the time to provide feedback. It is much appreciated! My mission here is to try to add depth of flavor to bone broth which I hope to incorporate into my diet for health benefits. Well if I am going to drink this on a regular basis I need to make the flavor a little richer more enticing. I would love to know what you think about using either Madeira or extra dry vermouth in exchange for the sherry since I have these on hand. Looking forward to exploring your cite. Hi Suzanne! I am fairly certain another one of my readers tried a combination of extra dry vermouth and white wine with good results. I love the idea of madeira as long as it's a dry madeira. I have actually substituted marsala for the sherry, and it was excellent. I think the main thing is to stay away from wine or fortified wine that is sweet. Best of luck, and thanks for stopping by! I have some mushroom stock cubes I love. They are expensive. It's never crossed my mind to make my own mushroom stock before. Sometimes, I need the obvious pointing out to me - thankyou for doing just that. I looked at those cubes online - just to have on hand for when I can't get a batch of stock made! They are expensive... Making it is so cheap - it's just made with leftover bits... I hope you try it! Have never made a mushroom stock but have always wanted to make one. Great idea to roast the vegetables first. Need to try this! Hope you had a wonderful Thanksgiving! Thanks MJ! I'm in North Carolina with our oldest, his wife, and our two little grandsons... Thanksgiving was lovely, and this time of year goes so fast! I hope you try the roasted mushroom stock. I know you'll love it! Such a fantastic use of kitchen scraps Tamara. I absolutely adore mushrooms but funny enough I never think to use mushroom stock in my soups. I guess I'm conditioned to always go for chicken or vegetable stock (why?!!). I think it is high time we change that. Honestly I can see myself eating just this stock alone (with a big old slice of crusty bread). It sounds that good. Dramagranates hahaha! Love it! I've had similar episodes - I once had a mini melt down on the phone to my BFF because my store didn't have organic baby corn! I've never made my own stock even though I keep saying I will, I think you've given me a the push to finally do it!